In May 2013, a two disc set was released called “Get Up! Stand Up! Highlights from The Human Rights Concerts 1986 – 1998”. That CD released featured a number of audio tracks taken from Amnesty International concerts throughout the years. No mention at that time was made that further releases were being planned. The U2 songs released on that earlier release were “MLK / Pride” and “Sunday Bloody Sunday”. In the Fall of 2013, a number of audio releases were made available under the title “¡Released! The Human Rights Concerts” which featured those same tracks plus additional tracks. In the UK, there were four CDs released on October 23, 2013, each with a different colour cover. In this case the U2 material is on the green covered CD, subtitled “1986: A Conspiracy of Hope”. On that 2-CD release there were three U2 tracks, “MLK / Pride”, “Sunday Bloody Sunday” and “Maggie’s Farm” all taken from the June 15, 1986 concert for Amnesty International held in East Rutherford, NJ. The U2 material is on the second disc of the two disc set. Bono also featured on the track “I Shall Be Released” credited to the Conspirators on this release. In the US, there was a double CD released on November 5, 2013, with the 1986 material on the first disc. Here, instead of two U2 tracks like the earlier “Get Up! Stand Up!” set had, or three U2 tracks like the UK set had, the US set had just one track “MLK / Pride” taken from the June 15, 1986 concert. This set also featured Bono on the track “I Shall Be Released” credited to the Conspirators. On iTunes however, worldwide, a release under the name of “¡Released! The Human Rights Concerts” on November 5, 2013 would add a number of additional tracks. 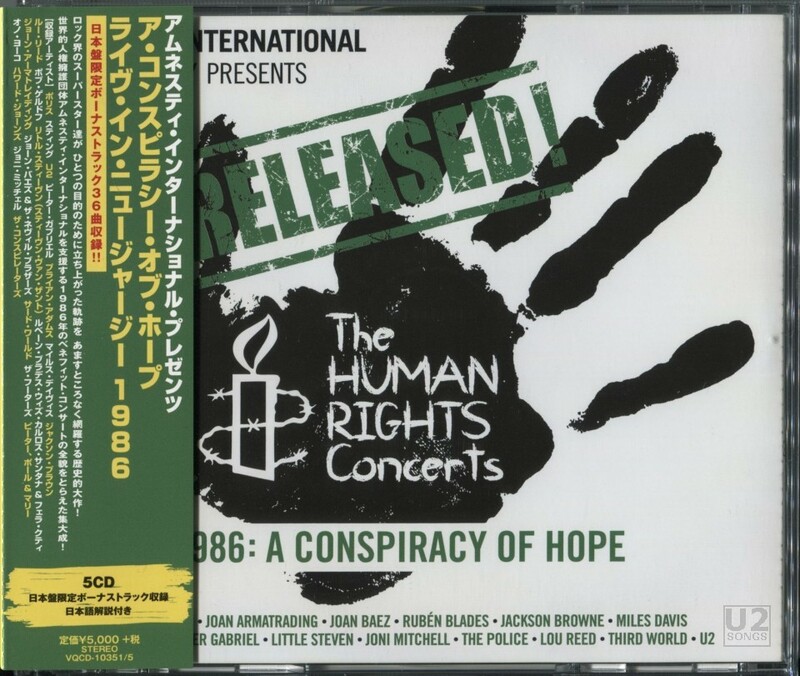 iTunes made a full 64 tracks available from the 1986 concert for Amnesty International. There were six tracks credited to U2, “MLK / Pride”, “Bad”, “Sunday Bloody Sunday”, “Maggie’s Farm”, a cover of the Beatles’ “Help!”, and a version of “Sun City” with Little Steven, Lou Reed, Ruben Blades and Nona Hendrix. Further, Bono appeared with the Police on “Invisible Sun” and with the Conspirators on “I Shall Be Released”. On December 25, 2013, a five CD version of this was released in Japan featuring all of the same songs that featured on iTunes. On some releases, “I Shall Be Released” has extra silence at the end, but the track length portion with audio is constant. A five disc DVD was also released in the fall of 2013, featuring a number of other U2 related video materials.